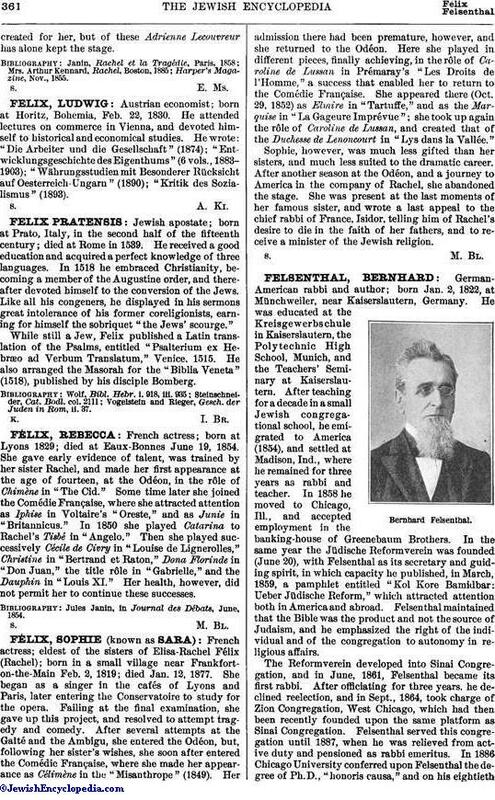 German-American rabbi and author; born Jan. 2, 1822, at Münchweiler, near Kaiserslautern, Germany. He was educated at the Kreisgewerbschule in Kaiserslautern, the Polytechnic High School, Munich, and the Teachers' Seminary at Kaiserslautern. After teaching for a decade in a small Jewish congregational school, he emigrated to America (1854), and settled at Madison, Ind., where he remained for three years as rabbi and teacher. In 1858 he moved to Chicago, Ill., and accepted employment in the banking-house of Greenebaum Brothers. 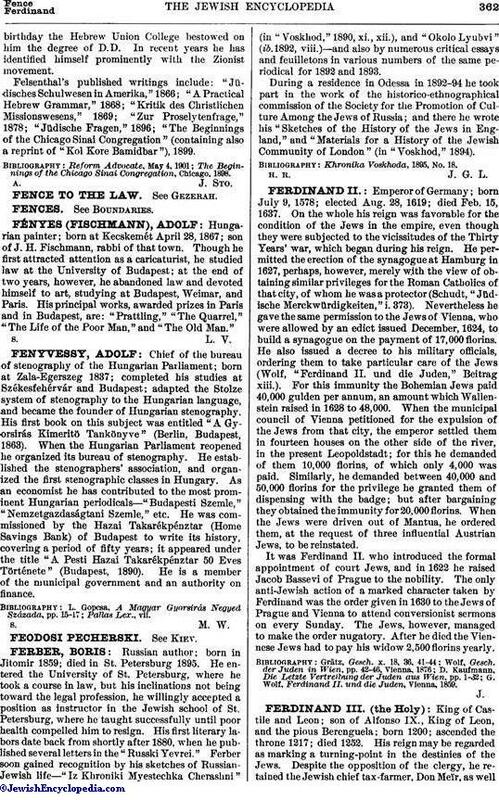 In the same year the Jüdische Reformverein was founded (June 20), with Felsenthal as its secretary and guiding spirit, in which capacity he published, in March, 1859, a pamphlet entitled "Kol Kore Bamidbar: Ueber Jüdische Reform," which attracted attention both in America and abroad. Felsenthal maintained that the Bible was the product and not the source of Judaism, and he emphasized the right of the individual and of the congregation to autonomy in religious affairs. The Reformverein developed into Sinai Congregation, and in June, 1861, Felsenthal became its first rabbi. After officiating for three years. he declined reelection, and in Sept., 1864, took charge of Zion Congregation, West Chicago, which had then been recently founded upon the same platform as Sinai Congregation. Felsenthal served this congregation until 1887, when he was relieved from active duty and pensioned as rabbi emeritus. In 1886 Chicago University conferred upon Felsenthal the degree of Ph.D., "honoris causa," and on his eightiethbirthday the Hebrew Union College bestowed on him the degree of D.D. In recent years he has identified himself prominently with the Zionist movement. Felsenthal's published writings include: "Jüdisches Schulwesen in Amerika," 1866; "A Practical Hebrew Grammar," 1868; "Kritik des Christlichen Missionswesens," 1869; "Zur Proselytenfrage," 1878; "Jüdische Fragen," 1896; "The Beginnings of the Chicago Sinai Congregation" (containing also a reprint of "Kol Kore Bamidbar"), 1899. The Beginnings of the Chicago Sinai Congregation, Chicago, 1898.